Remember Passwords In Microsoft Edge - Dangerous? You can let your computer remember passwords in Microsoft Edge so you don’t have to. But is it such a good idea to let your computer software deal with the responsibility of your passwords? Are there no security or privacy considerations to be made? In this article I’ll cover the do’s and don’ts of the password management functionality in Microsoft Edge to help you understand the potential pitfalls and common mistakes. When used correctly though, this feature can make your life quite a bit easier. Obviously you can use Microsoft Edge’s ability to remember your passwords on any login screen, but let’s take a look at the example of Microsoft’s free online mail services at live.com (previously Hotmail.com). 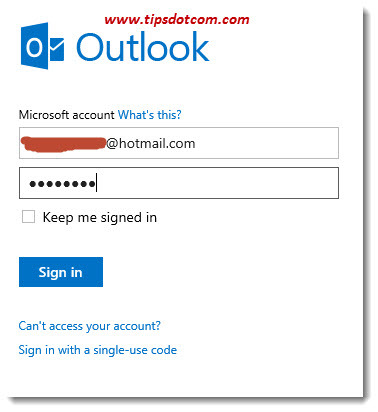 When you point Microsoft Edge to the login screen and enter your e-mail address and password, you will notice that the password you type is displayed behind bullets (see image above). This is of course to prevent that somebody looking over your shoulder would be able to see your password. As soon as you’ve typed your e-mail address and password, proceed normally and click the sign in button in order to go to your inbox. Simply click the yes button to remember your password in Microsoft Edge. The next time you visit the live.com login page, Microsoft Edge will automatically display your login information, which it has remembered for you. Please note: The screenshot just above looks identical to the first screenshot, but this time Microsoft Edge already shows the pre-filled password behind bullets, immediately as you visit the page. This entirely eliminates the need for you to enter your password again. Microsoft Edge Does Not Prompt You To Save Passwords? In some cases, it can happen that Microsoft Edge doesn’t offer the courtesy of remembering your passwords. Usually this is because the setting to save passwords in Microsoft Edge is disabled. As soon as you enable this setting, Microsoft Edge should start prompting you to save your passwords. 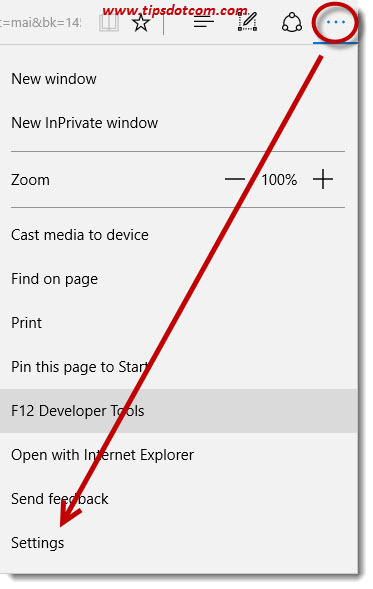 To enable the setting, click the three dots near the top right corner in Microsoft Edge and select “Settings” from the menu to go to the settings of your Edge browser. 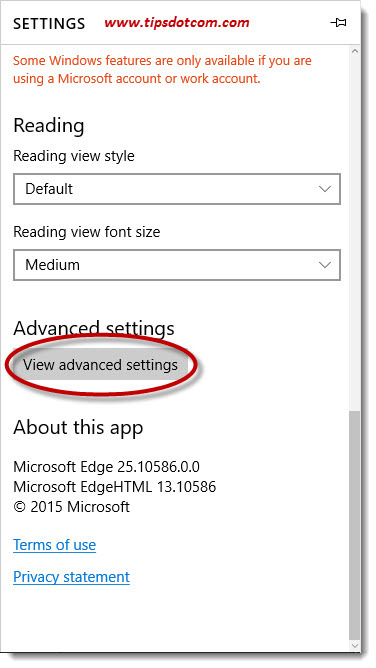 Use the scroll bar on the right in the settings menu to scroll down and click the “View advanced settings” button to open up the advanced settings screen in Microsoft Edge. Now make sure to switch the “Offer to save passwords” to the “on” position in order to remember passwords in Microsoft Edge. The “Save form entries” setting that you see right below the “Offer to save passwords” switch defines what will happen with plain text input boxes on web pages that you visit. Plain text input fields or boxes are those fields in a web page where you enter “regular” information, not passwords. Think stuff like a username or zip code and city information that you enter when shopping online. Anything that is not hidden behind bullets when you enter it in the web pages that you visit can also be remembered by Microsoft Edge with the “Save form entries” setting. 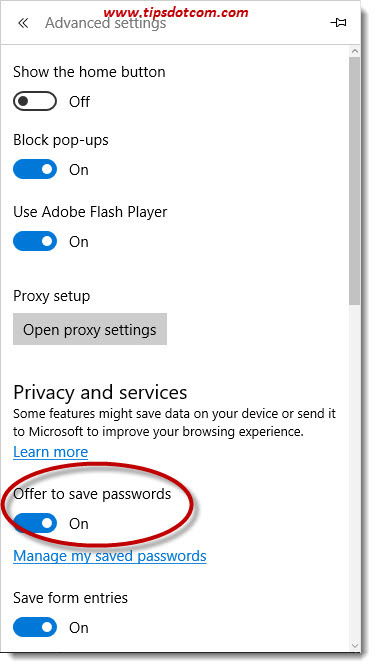 If you don’t want the option to remember passwords in Microsoft Edge, you can simply use the steps described above to go back into the advanced settings of your Edge browser and flip the switch that says “Offer to save passwords” to the off position. Please note though that disabling this option does not delete previously remembered passwords from Microsoft Edge’s memory. In other words, passwords that were already saved there will still be automatically filled out behind bullets by Microsoft Edge when you visit the corresponding logon page. If you want to get rid of those previously saved passwords as well, please check my article on how to clear Microsoft Edge cache data, in the relevant computer tips and trick section of my website. Also note that the option to remember passwords in Microsoft Edge will not make those passwords available in any other browser you might use (Internet Explorer, Mozilla Firefox, Google Chrome, ...). That's one of the reasons why I always recommend using a password storage utility, which will make your password management significantly more efficient. If this article was helpful, please leave a short comment in the commenting section below, I’d appreciate it, thanks!